The Supra HDMI-DVI cables connect computers, media players and screens for video and graphic images. SUPRA HDMI-DVI maintains the signal integrity up to >30metres cable length and allows transmissions in both directions i.e. the cable is bi-directional. It is available in two versions; HDMI-DVI and HDMI-DVI MET-S/B (Metal connectors with removable housings). HDMI-DVI is supplied with a moulded HDMI contact at one end (cannot be removed without cutting cable) and a removable DVI housing (the housing can be removed, but the contact block cannot without re-soldering). Provides for maximum resolution of 1920 x 1200P @ 24 fps (Hz). SUPRA launched its first HDMI/DVI cable in 2004. Nine years of continuous product development has resulted in the Supra HD5 HDMI/DVI, which according to us is the best HDMI/DVI cable on the market. We guarantee that the cable can handle 1080P @ 24 fps up to 32m. Passively! The Supra HD5 cable itself is tested and approved in compliance with the latest test provisions by HDMI´s Accredited Testing Center in the USA. A secure quality guarantee of our HDMI/DVI cables. The bandwidth in the HD5 (used in all of our HDMI/DVI cables) is 1100 MHz, over three times (> 3 x !) the specified of HDMI High Speed (340 MHz). Talk about headroom! 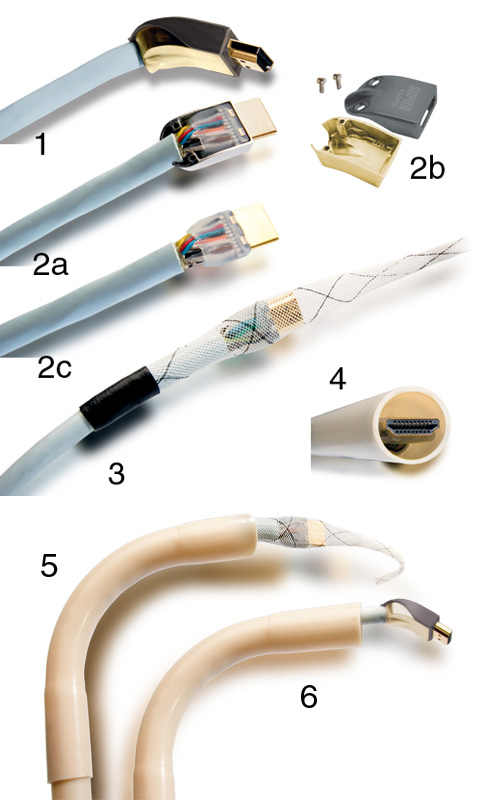 There are some interesting exotic cables out there claiming to do the job but only a few have the courage to let an independent institute validate claimed performance. Supra Cables is one of them. We often meet scepticism when we talk about HDMI cables. ”Does it really matter?” ”I mean, it’s only a data stream?" Yes, it is a stream of digital bits. And, yes, it does matter. When a cable is so poor that the picture blanks out, does not sync, you immediately notice something is wrong. Unfortunately there is an intermediate state before the signal is so corrupt it cannot be read and blanks out. Many claim that if the screen shows, the signal is good enough. There is circuitry in the receiver which tries to repair broken data stream by buffering and error correction, but this is based on best possible estimates and is not necessarily what was sent. Further, if there is time, the data protocoll allows for calling for re-submission of missing bitstreams. If there is time ... You might experience sync problems (delays), distorted colorations, insufficient blackness, noise and unexplainable audible pops during which the hardware is working overtime trying to repair the fragile bitstream. Do your precious hardware the best possible favour you can by connecting it using SUPRA HDMI cables and both you and your equipment will fully enjoy the show.